The afternoon started with the official opening of MAXXI's new echibition, which aims to create a greater awareness of Chinese history and culture in Italy as the relationship between the two countries grows ever stronger. This growing rapport is expected to be marked by the historic signing of a Memorandum of Understanding on the Belt and Road initiative by Conte and Jinping during the latter’s visit. On display were an array of items, ranging from traditional dresses and jewellery to ornate vases and historic writing utensils. 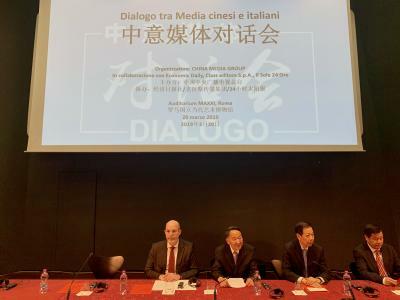 The inauguration was followed by a presentation in the MAXXI auditorium on the partnership between Italy and China in the media. Chinese delegate Jiang Jianguo, Deputy Minister of Communication in the Central Committee of the PPC, opened the event by welcoming the ever-growing links between the two nations and heralding the MoU as a way for the two cultures to grow further, learning from one another. He declared that “media must act responsibly” and called on a need for a free media that prides itself on reporting facts, not speculation. He concluded by encouraging those present to write a new story for the Belt and Road Initiative away from historical differences and prejudices. Jianguo was followed by Chinese Ambassador to Italy S.E. Li Ruiyu who spoke of China’s desire to “call on all countries to work together multilaterally” over the coming years to create a closer unity between nations. He pointed out that China was still in a state of development and acknowledged that in its rapid growth mistakes had been made, but he spoke of China’s continued desire to open up to the world culturally and economically and learn from others. “All roads lead to Rome,” he quoted, and he spoke on China’s behalf at the excitement of the great possibilities that this union between the two nations could lead to. Vito Crimi, Italian State Secretary of the Council of Ministers with responsibility for information and publishing, echoed many of these points and highlighted the cultural and informational implications of the Belt and Road beyond the mere economic advantages it is hoped it will bring. Crimi went on to address the importance of rules in future relationships, a move which was likely aimed at appeasing voices of discontent across the nation who see the MoU as paving the way to Chinese control in Italy and a loss of autonomy. He spoke of a “collaboration that would be based on rules,” and assured those present that when an MoU was signed it was simply to “write down, in black and white, a set of rules that would ensure reciprocity”. The event also saw the signing of an accord of collaboration between China’s Economic Daily newspaper and Italy’s Il Sole 24 Ore with representatives of Rai and Mediaset lauding the move as a great step forward in media collaboration between the nations.